What is Air Conditioner Condenser? AC condenser units are grouped according to how it rejects the heat to the medium (surround air). Here are a few condensers units. Air cooled condensers are mostly used in a residential air conditioner system and commercial air conditioning unit. 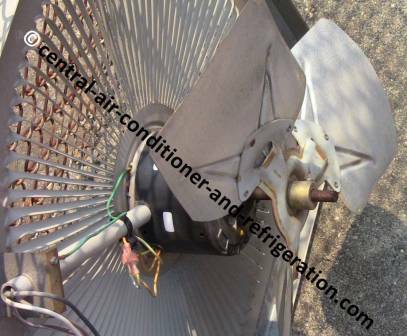 The air conditioner parts that are located beside residential are an air cooled condenser. Here it is. 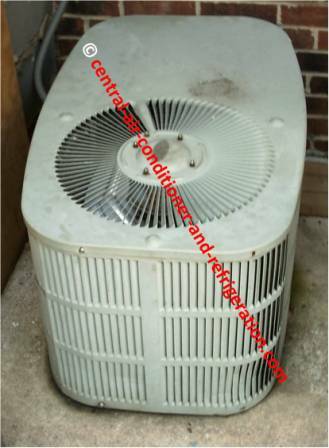 • Air conditioner compressor is within the condenser unit, but it does not help with heat rejection! The condenser fan is mounted with the air cooled condenser. The condenser fan primary purpose is to increase condenser unit’s capacity to reject heat. The water cooled condensers reject the heat absorbs by air conditioner system to the water. The water has to be clean, noncorrosive, and at certain temperature. This water has to be treating to prevent pitting corrosive, algae, scale, chalky, and mineral deposits. Even though, water cooled condenser require regular maintenance, it is more efficient than air cooled condenser, and it operates at much lower condensing temperature. What are air conditioner condensers? Air conditioner condensers are a heat exchanger device; it has a similar operation principle to the evaporator. The condenser rejects heat from the air conditioner system to surrounding air (medium). While the evaporator absorbed heat from space that needs to be cool. In our case, it is from indoor air. The condenser units take in high-pressure, high temperature refrigerant gas from the compressor and turn it into high-pressure, high temperature liquid refrigerant. How does an ac condenser change refrigerant gas to liquid refrigerant? Here how it does that. Air conditioner condensing unit work by turning vapor refrigerant to liquid refrigerant. There are three important steps that will happen to the refrigerant as it passes through the condensing unit. First Step: The hot vapor coming from the compressor must be de-superheated to the vapor saturation point. De-superheated? De-superheated is removing a sensible heat from the refrigerant, lower the refrigerant temperature. Second Step: In the middle of the condenser, there should is mixture of gas/liquid refrigerant. This is where the refrigerant vapor should change to 100 percent liquid refrigerant. Third Step: The refrigerant temperature should be below the liquid saturation point, subcooled. How does air conditioner condensers make? Refrigeration is the process of removing heat from one area, where it is not wanted, to an area where it is not important. For the refrigeration process to work heat has to flow from one area to another. Here is a step to how heat will be transfer from AC evaporator coils to AC condensing unit. Air conditioner condenser rejects heat and the process start again. In this discussion, the air conditioner condensers will transfer heat to air (not water). For heat to flow, one of the areas has to be at a higher temperature. This is because heat always flows from a high intensity to a low intensity. The air conditioner condensers reject heat from the refrigeration system absorbed at the evaporator and also heat of compression from the compressor. The condenser contains refrigerant that must reject its heat to the outside medium (air that surrounds the condenser). Therefore, the refrigerant temperature in the condenser units must be higher than the surrounding air. If we take thermodynamic classes, our professor expect us to understand it . I will explain how air conditioner condensing unit work from PH charts. The condenser units receive the hot vapor refrigerant after it leaves the compressor through the short refrigeration line between the compressor and the condenser unit. This refrigerant line has known as the hot gas line or discharge line. 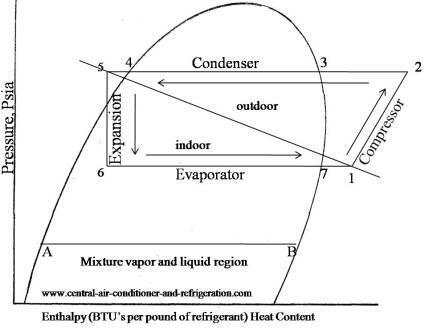 Point 2 on the pH diagram showed the hot vapor from the compressor is forced into the top of the condenser coils. The vapor refrigerant is being pushed at high speed and high temperature to the condenser units. The vapor does not corresponding to the saturation pressure/temperature relationship because the vapor contains superheat added by the evaporator and the heat of compression process. This process is shown between points 2 to 3. The vapor entering the condenser is so hot compared to the surrounding air that a heat exchange begins to occur immediately after the vapor leaves the discharge area of the compressor. Generally, the air will be 90-105°F lower than the superheated vapor leaving the compressor. The first heat exchange removes sensible heat from the superheated vapor bringing the refrigerant vapor to the saturation point, point 2 to 3 on the pH chart. As the refrigerant vapor continues through the condenser latent heat is removed. This process is shown between points 3 and 4. The removal of latent heat causes a change of state to take place. The vapor will begins to change to liquid from this point on until it reaches a point nears the end of the condenser units where the entire vapor has changed to liquid. This is known as the saturated liquid point, point 4 on the pH chart. As the air conditioner refrigerant flows through the last few rows of the condenser units additional sensible heat is removed, lowering the refrigerant temperature below its liquid saturation point. This called subcooling and represented by the line from point 4 to 5 on the pH chart. There must be enough air flowing across the AC condenser, for vapor refrigerant to change to liquid. The air flowing across the condenser unit has to be correct. This airflow has to be at low enough temperature, so it could absorb heat from the condenser unit. The entire vapor refrigerant has to turn liquid before it leaves the condenser units. Removing latent heat or condense. Removing more sensible heat (subcooled). This is how air conditioner condensers work in HVAC units. Read other central air conditioner parts.